Here’s some background info about the photograph. I translated the article from Norwegian to English but the translation isn’t perfect. For Max, Tuesday was the result of weeks of training, motivation, watching Youtube clips, acting like a mascot, and so on, writes the father of the eight year old boy in a letter to the boy’s new hero , the Swedish soccer star Kim Kallstrom. Max and ten children with Williams syndrome had the pleasure to be mascots for the Swedish football stars in front of 50 000 spectators during the World Cup qualifying match between Sweden and Germany at Friends Arena on Tuesday of last week. The disease gives children a happy demeanor but they have problems concentrating and relating to the outside world. Still, Max fully realized how great it was going to be he mascot for your favorite players. So great was the occasion that Max had trained for several weeks and dared to go out onto the pitch. He was scared and nervous when the moment came, but was out on the field and lined up with national stars. 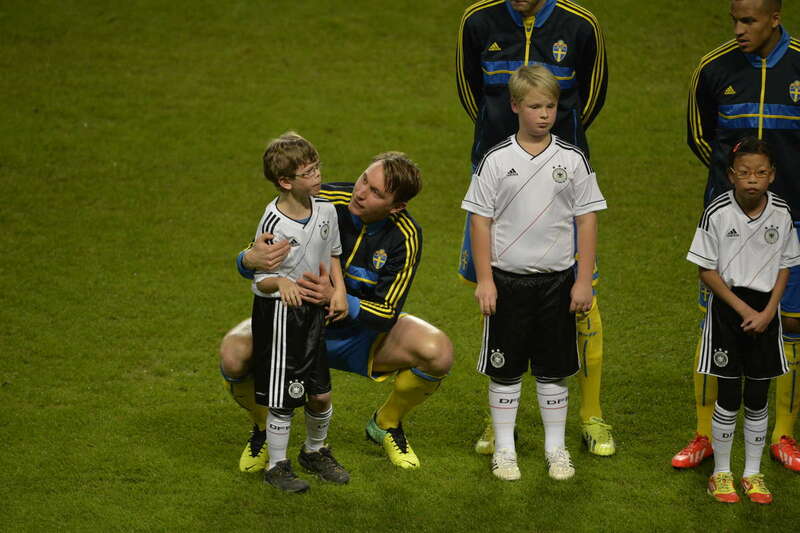 Thanks to Kim Kallstrom, who sat down and hugged and reassured the boy, 8 year-old Max completed his mascot job. Max’s father said “Because of your actions, Kim, my son was able to experience exactly the same feelings as everyone else: pride, a sense of being special, “I did it” and the joy”, writes Max’s father Emil in a letter of thanks to Kallstrom. The letter explains how important Max’s father thought it was for the boy to dare to undertake the mascot job. Kindness can mean so much to people! I hope more and more people realize this.